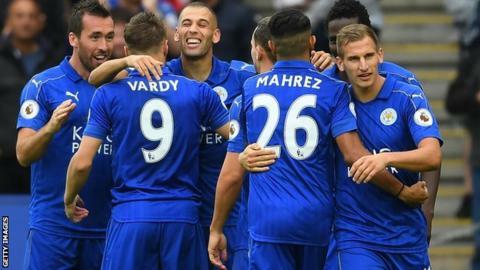 Leicester City's record signing Islam Slimani marked his Premier League debut with two goals as the champions outclassed Burnley. The striker opened the scoring in the last minute of the first half with a header from Christian Fuchs' free-kick. He made it two just after the restart with another header and Ben Mee's own goal completed the scoring. The win capped off a great week for the Foxes, who also won 3-0 at Club Brugge in the Champions League on Wednesday. Islam Slimani's touchmap on the left shows how much work he got through for his team, in addition to scoring two goals on his Premier League debut. By contrast, Burnley striker Andre Gray's (on the right) shows how little impact he was able to have on the game as Leicester simply outclassed the Clarets. Slimani, who arrived for a reported £29m from Sporting Lisbon last month, had a Premier League debut to remember. The 28-year-old Algerian should have opened his account when he somehow failed to connect with a deep cross from Marc Albrighton before he got off the mark for his new club. Matt Lowton needlessly fouled Albrighton on the left-hand edge of the area in the last minute of the first half and Slimani powerfully headed home Fuchs' free-kick. He was celebrating his second goal in the 48th minute with another header after Jamie Vardy flicked on Riyad Mahrez's low cross after the Clarets gave away the ball in their own half. His goals were not the only thing that stood out on Saturday, though, as he linked up well with fellow Algerian Mahrez and strike partner Vardy. Manager Claudio Ranieri, whose team had picked up only four points from their first four league matches before Saturday, will also have been pleased with the industry his new striker showed when closing down the Burnley defence. It was a hard afternoon for Sean Dyche's side. They could have got the day's first goal when Steven Defour headed straight at Ron-Robert Zieler after Scott Arfield headed George Boyd's cross across goal to him. However, they never recovered from conceding the first goal and were probably fortunate to only lose by a three-goal margin. Dyche started with a five-man midfield but this left Andre Gray isolated. Once the Foxes scored their second goal, the Burnley striker was a mere spectator as the hosts showed why they were last season's champions. The Clarets could do little to stop Mahrez and he claimed the assist for the third goal when Mee put though his own goal from his low cross. Burnley substitute Johann Berg Gudmundsson's deflected free-kick forced a good save from Zieler in the dying minutes and Dyche will have at least been pleased with how his side continued to compete with the game over as a contest. "The reality was four minutes of madness - two before half-time and two after," Dyche said. Leicester City boss Claudio Ranieri: "I am very happy with the result and the performance of the players. I was curious to see how my players reacted after the Champions League and they reacted very well. "After the victory in the Champions League, it was very important to continue in the Premier League. "We scored three goals and Islam Slimani scored twice. I think our fans are very happy. It's important Slimani continues to score because if he only scores in the first match we have a problem. He is a good lad and very happy." Burnley boss Sean Dyche: "We gave away a really poor free-kick and they score. You go into half-time and try and change things and calm things down. Then we give away another poor goal. "You are in trouble after that because we're playing against a very good team. We have to keep learning and keep moving forward." Islam Slimani had a Premier League debut to remember. The striker scored twice and gelled seamlessly with his new team-mates. His link-up play with both compatriot Riyad Mahrez, who also had an excellent game, and strike partner Jamie Vardy will give Foxes fans hopes for another very good season. Leicester host Ranieri's former side Chelsea in the third round of the EFL Cup on Tuesday, while Burnley are back in action with a home game against Watford a week on Monday. Islam Slimani has scored nine headed goals in league competition in 2016 - seven for Sporting Lisbon in the Portuguese Liga and two for Leicester City in the Premier League. Slimani's league goal tally in 2016 stands at 22 goals in 23 league appearances. Leicester City are unbeaten in 10 successive league games against Burnley (W7 D3 L0). Burnley have failed to score in six of their last eight Premier League games away from home. The Clarets attempted two shots on target in this match. They have attempted just four in their last three Premier League games overall, while they have allowed their opponents 19 shots on target in those three matches. Match ends, Leicester City 3, Burnley 0. Second Half ends, Leicester City 3, Burnley 0. Attempt missed. Sam Vokes (Burnley) left footed shot from outside the box is high and wide to the right. Assisted by Jeff Hendrick. Offside, Burnley. Matthew Lowton tries a through ball, but Patrick Bamford is caught offside. Attempt missed. Sam Vokes (Burnley) header from the centre of the box misses to the right. Assisted by Stephen Ward with a cross. Attempt saved. Johann Berg Gudmundsson (Burnley) left footed shot from outside the box is saved in the centre of the goal. Patrick Bamford (Burnley) wins a free kick in the attacking half. Islam Slimani (Leicester City) wins a free kick in the attacking half. Substitution, Leicester City. Andy King replaces Daniel Drinkwater. Substitution, Burnley. Patrick Bamford replaces Andre Gray. Own Goal by Ben Mee, Burnley. Leicester City 3, Burnley 0. Corner, Leicester City. Conceded by Johann Berg Gudmundsson. Attempt blocked. Marc Albrighton (Leicester City) right footed shot from outside the box is blocked. Assisted by Riyad Mahrez. Attempt blocked. Daniel Drinkwater (Leicester City) right footed shot from outside the box is blocked. Assisted by Christian Fuchs with a cross. Corner, Leicester City. Conceded by George Boyd. Attempt blocked. Christian Fuchs (Leicester City) right footed shot from outside the box is blocked. Attempt saved. Daniel Amartey (Leicester City) left footed shot from a difficult angle on the left is saved in the centre of the goal. Attempt blocked. Riyad Mahrez (Leicester City) left footed shot from outside the box is blocked. Assisted by Christian Fuchs. Corner, Leicester City. Conceded by Michael Keane. Attempt saved. Marc Albrighton (Leicester City) right footed shot from outside the box is saved in the centre of the goal. Assisted by Jamie Vardy. Offside, Burnley. Ben Mee tries a through ball, but Andre Gray is caught offside.